Mexico – The country’s most visited protected area showcases a natural marvel and mark your calendar — butterfly season lasts from November to March. Sanctuaries in the states of Mexico and Michoacan open their tourist services to the public from November to March. 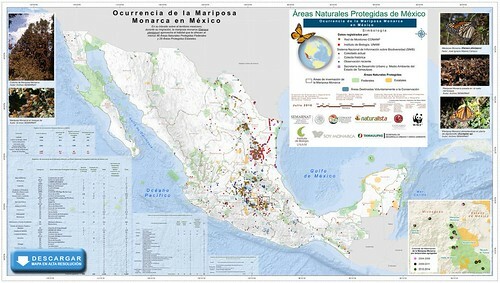 These protected areas include l Rosario, Chincua, Cerro Pelon in Donata Guerra, Herradura and La Mesa. The first two are in the state of Michoacán and the last three are located in the State of Mexico. Check ahead of time for reservations. Angangueo has an old train station recently restored as the beginning of the newly-installed Monarch Green Way, a four-kilometer trail conecting two stations, this might be the beginning of a national rails to trails network in Mexico. Any one can bike it but there is no bike rental. One great trip is bike downhill to Zitacuaro. The sight of butterflies blanketing the trees is beautiful , but not as majestic as when they glide through the forest. When the sun comes out and the temperature warms, the butterflies drop from the trees to fly and drink nectar from flowers and dew collected on the ground. 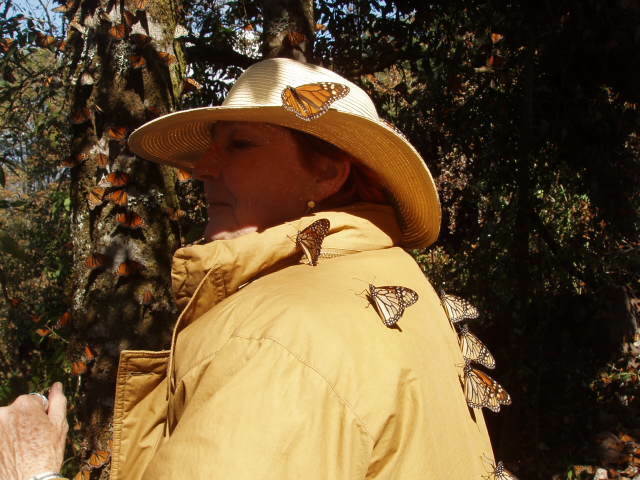 In Spring, as the days get longer and the temperatures rise, the monarchs begin their northward flight, deserting the forests until the following autumn. The park, one of Mexico’s most prominent environmental attractions, is also one of its least understood. It seems incredible that few services exist for the eco traveler interested in conservation. Worse, the tours that do exist are aimed at day-trippers who generally pack their own lunches. In other words, the flood of tourists visiting the park provides few economic benefits to the community. So if you’d like to contribute to the conservation of the region, spend a night or more in nearby communities. Transportation — From Mexico City, direct buses leave several times a day from the Terminal Poniente bus terminal (at the Observatorio Metro station) for Angangueo. If you miss that bus, take a bus to the larger town of Zitácuaro and make the switch to an Angangueo bus from there; buses leave every 15 minutes. Drivers will take Highway 15 West. There is a turn-off at Zitácuaro and take Highway north to Angangueo. Angangueo is the best developed hub for travel in the reserve. Once you’re in town, if you don’t have your own transportation find other travelers interested in seeing the butterfly sanctuary and rent a pickup. Prices are fixed by a local cooperative. This price is good for up to ten passengers, so it’s obviously cheaper if more people split the cost of the vehicle. From Angangueo you can also travel to Chincua, another reserve on the Michoacán–Mexico state border, which opened to the public in late 1996. A second option is to travel to Ocampo, which also has a small road to El Rosario. TIP — Weekends tend to be more overtouristed. A more quiet time to visit the sanctuary is mid-week. The MJV is a partnership of federal and state agencies, NGOs, and academic programs working together to coordinate efforts to protect the monarch migration.